NEWS + TRENDS TechWatch + CLEAN DATA Powering the Cloud A new report released in April by Greenpeace International explores energy consumption and growing cloud infra- structure. "How Clean Is Your Cloud?" asks how much energy is needed to power our online world and what percentage of global greenhouse gas emissions comes from the IT sector. The report details the energy choices of some of the largest and fastest growing IT companies, including Amazon Web Services, Apple, Dell, Google, Facebook, and Twitter. The report states, "The growth and scale of investment in the cloud is truly mind-blowing, with estimates of a 50-fold increase in the amount of digital infor- mation by 2020 and nearly half a trillion in investment in the coming year." The way we communicate, learn, and seek + DIGITAL ACCESS University Wins Award for Pilot Program Arizona State University (ASU) has been recognized by the National Association of Campus Card Users with the organiza- tion's inaugural Innovative Technology Award for a mobile access control pilot the University conducted with HID Global. ASU received the award in recognition of the pilot program's ground- breaking work in validating the use of digital credentials on NFC smartphones for physical access control on a college campus. The pilot, completed in the summer of 2011, consisted of a group of ASU staff and students with NFC smartphones con- taining HID Global's Secure Identity Object (SIO) technology. The pilot participants gained access to their residence hall and selected rooms by presenting the phones to their door read- ers, just like they do with existing physical campus ID cards. Participants used a variety of popular smartphones connected to all major mobile networks. Feedback from the pilot participants cemented ASU's vision of a future where virtual identities can be created for each regis- tering student and then delivered to them via a mobile applica- tion. Eighty percent of the participants said using a smartphone to unlock a door is just as convenient as using campus ID cards, and nearly 90 percent said they would like to open all doors on campus using their smartphones. In a release from HID Global, Laura Ploughe, director of busi- ness applications and fi scal control, University Business Services at ASU, says, "This pilot proved the viability of the NFC-based mobile access model using secure portable credentials and the next generation of advanced access control systems, and also con- fi rmed the high value that staff and students place on using their phones for more and more applications, including opening doors throughout the campus. 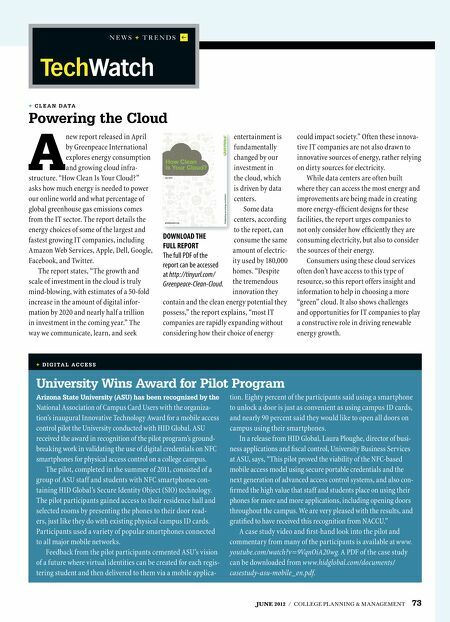 We are very pleased with the results, and gratifi ed to have received this recognition from NACCU." A case study video and fi rst-hand look into the pilot and commentary from many of the participants is available at www. youtube.com/watch?v=9VqnOiA20wg. A PDF of the case study can be downloaded from www.hidglobal.com/documents/ casestudy-asu-mobile_en.pdf. 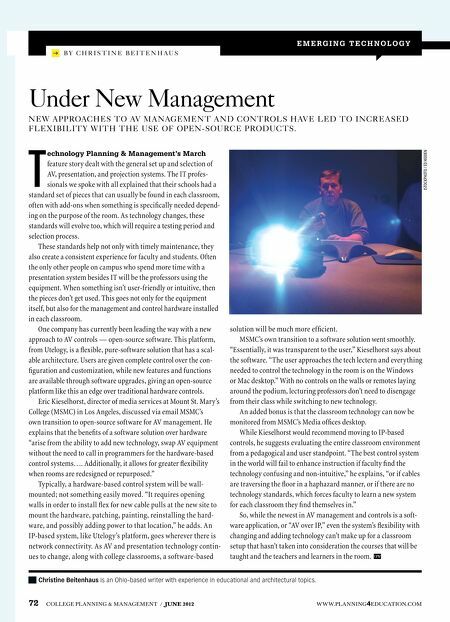 JUNE 2012 / COLLEGE PLANNING & MANAGEMENT 73 entertainment is fundamentally changed by our investment in the cloud, which is driven by data centers. Some data DOWNLOAD THE FULL REPORT The full PDF of the report can be accessed at http://tinyurl.com/ Greenpeace-Clean-Cloud. centers, according to the report, can consume the same amount of electric- ity used by 180,000 homes. "Despite the tremendous innovation they contain and the clean energy potential they possess," the report explains, "most IT companies are rapidly expanding without considering how their choice of energy could impact society." Often these innova- tive IT companies are not also drawn to innovative sources of energy, rather relying on dirty sources for electricity. While data centers are often built where they can access the most energy and improvements are being made in creating more energy-effi cient designs for these facilities, the report urges companies to not only consider how effi ciently they are consuming electricity, but also to consider the sources of their energy. Consumers using these cloud services often don't have access to this type of resource, so this report offers insight and information to help in choosing a more "green" cloud. It also shows challenges and opportunities for IT companies to play a constructive role in driving renewable energy growth.